[S414] Hon. Horace L. Moore, Andrew Moore, Page 41. [S414] Hon. Horace L. Moore, Andrew Moore, Page 42. Henry C. Holcombe was born on 28 August 1857. He was the son of Benajah Dwight Holcombe and Maria Augusta Payne. 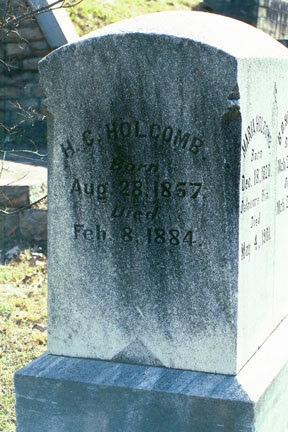 Henry C. Holcombe died on 8 February 1884 at OK at age 26. He was buried at Oakland Cemetery, Atlanta, GA; Block 358, Lot 3. Oliver E. Holcombe was born circa 1844 at IN.1 He was the son of Ethiel Porter Holcombe and Ellen Oliver.1 Oliver E. Holcombe died on 7 March 1863 at Young's Point, LA. The name as written in the 1850 census could be "Henry P. Holcomb." [S284] Courant, 6 June 2000. Mrs. Hattie A. Holcomb, 77, wife of Hiram L. Holcomb of 41 South Hudson Street, died Friday morning at her home. She was born in Barnet, Vt., and was a member of the Methodist Church of Florence, Mass. Besides her husband she leaves a son, Frank E. Holcomb of San Francisco. The funeral will be held Monday at 2 p.m. at the funeral home of Morrison W. Johnson, 740 Albany Avenue. Burial will be in Florence, Mass. [S284] Courant, 17 September 1932. Cleo V. Case was born on 10 August 1889 at Simsbury, Hartford Co., CT.1 She was the daughter of Frank Converse Case and Louise M. Heim.1 Cleo V. Case died on 3 May 1966 at age 76.1 She was buried at Forestview Cemetery, Winsted, Litchfield Co., CT.
[S101] Ruth Cost Duncan, John Case, Page 177. Louisa (?) also went by the name of Lottie (?) She was born circa 1869 at MS.
Daniel Case III was the son of Daniel Case and Carol (?) Daniel Case III died on 24 June 2002 at San Francisco, San Francisco Co., CA. Zenas Briggs was born on 2 February 1831. He was the son of Uriah Briggs and Mary Holcombe. Zenas Briggs died on 23 March 1831. He was buried at Woolhouse/Hunn Cemetery, Canandaigua, Ontario Co., NY. Benjamin Holcombe was born circa 1887 at Kiev, Russia.1 He was the son of Joseph Holcombe and Sophie (?) Benjamin Holcombe married Rose (?) on 9 October 1911.1,2 Benjamin Holcombe died on 27 December 1950 at Hartford, Hartford Co., CT. There is no indication, or suspicion, that Benjamin is descended from the English Holcombe families. Benjamin and Rose were enumerated in the 1920 Hartford, Hartford Co., CT, federal census, ED 83, page 12A. He was a shipping clerk, age 32; she was 26. Children in the household were Anne, Esther, Helen and Rebecca. Benjamin and Rose were enumerated in the 1930 Hartford, Hartford Co., CT, federal census, ED 23, page 15A. He was a building superintendent, age 42, she was 38. Children in the household were Anna 16, Esther 14, Helen 12, Rebecca 10, and Samuel 4. Rose (?) was born circa 1893 at Vilna, Russia.1 She married Benjamin Holcombe, son of Joseph Holcombe and Sophie (? ), on 9 October 1911.1,2 Rose (?) died on 11 April 1980 at Hartford, Hartford Co., CT.
[S284] Courant, 1 October 2002, page B9.